At Steve's Service, we are the Inland Empire's tankless water heater experts. From sales and installation to service and maintenance, our plumbers are qualified to work on all makes and models of tankless water heaters. If you are debating between a traditional water heater and a tankless one, we can provide you with honest recommendations based upon your specific needs and budget. Or, if you already own a tankless water heater, we can help you maximize its performance, energy efficiency, and lifespan. Tankless water heaters offer significant benefits over traditional water heaters. First, because they produce hot water on demand, they can provide endless hot water and are highly energy efficient (approximately 30-40% more efficient). Second, their compact size can free up valuable space in your home or business. Third, tankless water heaters often qualify for energy rebates and can reduce your monthly utility bills. 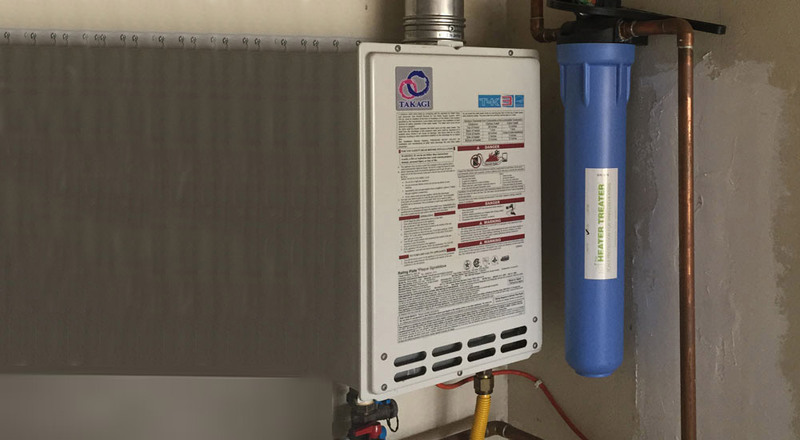 Finally, tankless system can provide clients with greater flexibility since they can be used to supplement an existing water heater, piped in parallel or series, and installed nearly anywhere. Steve's Service sells and installs all major tankless water heater brands, including Takagi, A.O. Smith, Noritz, Rinnai, and Navien. These brands offer the most energy-efficient and reliable gas and electric tankless water heater systems for residential and commercial use. We have options to accommodate every budget and can retrofit nearly any property to accommodate them. We've installed tankless water heaters in master baths, in closets, under sinks, next to Jacuzzi tubs, above attics, in garages, behind exterior walls, and more. Additionally, we sell and install scale inhibiting filters (heater treaters), which help to break down hard water before it reaches your system to potentially cause scale build up. For tankless water heaters, regular maintenance/descaling is extremely important if you want to maintain its efficiency, prolong its life, and protect your warranty. Tankless water heater maintenance involves flushing it with a descaling solution for 30 to 45 minutes, which removes hard water deposits and thoroughly cleans it. Descaling is recommended once every one to two years--more often if you have really hard water, less frequently if you have a heater treater or water softener system. If you are interested in determining how hard your water is, we can come out and do a water hardness test or you can contact your water company. In general, annual maintenance service for tankless water heaters is best. Steve's Service has the experience and expertise to perform all types of repairs on all brands of tankless water heaters. This includes changing out the heat exchanger when there is an internal leak to repairing the gas valve when there is no hot water. Our technicians have worked on tankless water heaters for years; are factory trained by Takagi, Noritz, and Rinnai; and receive ongoing training direct from the manufacturers. To ensure that we have everything we need to fix your tankless water heater issue on the first visit, we keep our trucks fully stocked and have access to a large inventory of parts. Call today for a free estimate for tankless water heater sales/installation, repair, or service in Upland, Fontana, Pomona, Ontario, Glendora, Rancho Cucamonga, and surrounding cities throughout San Bernardino County. We are licensed and insured, and an authorized dealer for Takagi. For a new or replacement tankless water heater, we can go over any available rebates and provide professional recommendations customized to your specific needs.